« Danish translation: Håndbog for skeptikere! Fantastic. Just out of the blue — I had no idea it was coming — a team in Brazil has created a Portuguese translation. They contacted me when it was all done and finished. It’s remarkable. Thank you! It’s home is on the fake climate site. (Click on the image to go straight to the pdf.) But I have a copy here as a back up. Thanks especially to Professor Ricardo Augusto Felício (University of São Paulo – Brazil) and and Marcel Ligabô, Secretary. They’ve done a very professional job. We are a group of climatologists, geographers, meteorologists and others from different areas, who stand as critics on “climate change”, “global warming” and “sustainable development”. Please, send this link, or the fakeclimate one, to all your Portuguese, Brazilian or South American friends. Let me know if anyone has a contact in Portugal itself so we can spread the word there. It’s the sixth most common language in the world, with around 200 million native speakers. About half of South America speaks it, as well as many in Angola, Mozambique, Macau, and East Timor. 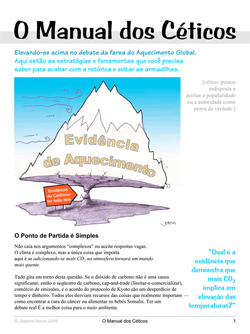 UPDATE: If you are looking for more information in Portuguese, check out http://www.midiaamais.com.br/ambientalismo. More than 30 columns, as well as numerous news clippings and videos related to the AGW fraud are published there. Agradecimentos a nossos amigos brasileiros para a tradução. Show off! ) Tranlation Please!!! Good to hear from you again Brian…How’s work??? The translator makes it clear on his web page that if Brazil goes along with the Copenhagen crap, then Brazil dosn’t have authority over the Amazon River anymore. Good Night – how do you like the do-nothing UN giving themselves authority as World KGB? Work at DOE is good, thanks. Patrick Michaels, envoronmental consultant for the Cato Institute in the US, asked me to make a short video of my sentiments about AGW and Copenhagen. Many people are making these little video vignettes, which Cato will publish on You Tube in advance of Copenhagen. I hope Copenhagen sees deathly cold weather in December. Brian G Valentine: I just saw this at WUWT post tonight! I’m getting sick! I’m getting mad! The U.S.Chambers of Commerce just did an 180 towards Cap & Trade, conceding with Pelosi and Kerry…I’m seeing “red” right now…. Brian G Valentine: Post 3 Good to hear about work…I would love to see what you have to say on YouTube! I hope there’s a Blizzard…Maybe we should call the “Goric”..Weather always travels with Him..you know the “Gore Affect”! That thing about the Chamber of Commerce broke my heart. I thought, here is a group not going to cave into the crap – in the interests of the less well off. CofC, this is godawful. Just when you think it can’t get more insane! Or you thought it was actually getting better. Everytime it looks like the entire hoax is about to collapse, it rises up again in some monstrous way. Brian, can you let us know when the videos are up, can’t wait. Can anyone explain in simple terms the Spencer on Lindzen? What’s Happened to the “Climate” section from The Australian?? The Australian (online newspaper) used to have a special section on climate change. Climate was listed in the toolbar accross the top of the page. This is now gone completely as well the complete section containing all the most recent stories (and propaganda)on climate change. Does this mean The Australian no longer regards climate change stories as newsworthy? Or is it some sort of Orwellian strategy? UPDATE Jan 10- 2010: If you are looking for more information in Portuguese, check out http://www.midiaamais.com.br/ambientalismo. More than 30 columns, as well as numerous news clippings and videos related to the AGW fraud are published there. Oi como vai estava viajando fui a espanha e italia,tenho saudades,ainda nao sei se irei passar o carnaval no rio,mais irei fazer o possivel,e seu filho como vai,ja aprendeu a falar portugues? Eu pesso desculpas mas ainda nao aprendi a falar e nem a escrever mais sempre se acha um jeito. Muitos beijos nao se esqueça da minha camisa do CHICAGO BULLS.